Ravel's Pavane pour une infante défunte has been arranged for 12 celli by Kars Sebastian Keen, who has taught for over 10 years at the Hochschule für Musik in Weimar. In 2007, he was a founding member of the "12 Thüringer Cellists" – comprised of the leading cellists in Thuringia/Germany – for which he wrote and arranged numerous works. Pavane pour une infante défunte is an impressionistic early work of french composer Maurice Ravel. Originally, it was a piece for piano which he wrote in 1899 as a student at the Conservertoire de Paris. 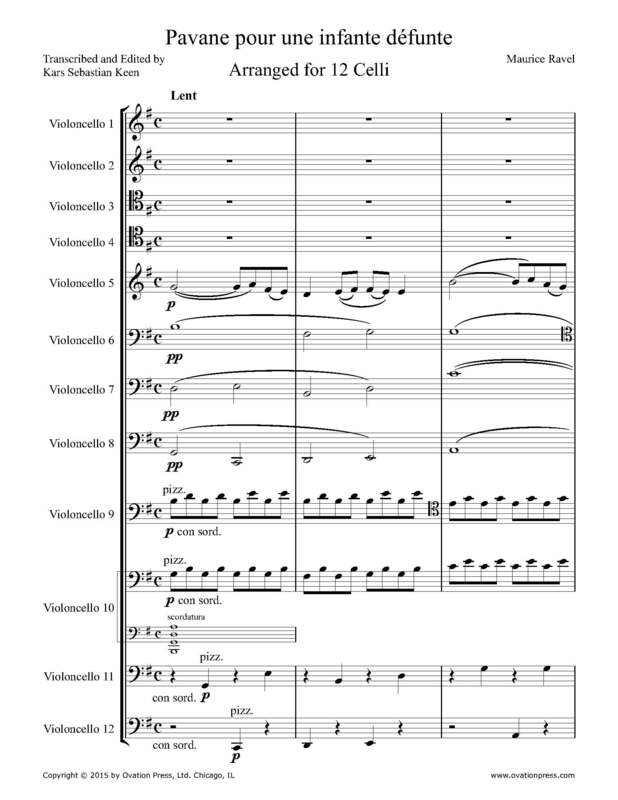 Over a decade later, in 1910, Ravel published a version for orchestra. With its rich harmony and stunningly beautiful melodic writing "Pavane pour une infante défunte" suits the luscious sound of a Cello ensemble very well. The original piano version was dedicated to the Princesse Edmond de Polignac, a French-American musical patron. Although the literal translation of the title is "Pavane for a dead Princess", Ravel went to great lengths to point out that the composition was not a funeral lament, "but rather an evocation of the pavane that might have been danced by such a little princess as painted by Velázquez" (referring to Spanish painter Diego Rodriguez de Silva y Velázquez' portrait series of the Infanta Margarita Teresa, who had a tragically short life). Download and print the score today to gain access to this expertly edited arrangement of Ravel's Pavane pour une infante défunte for 12 celli by Kars Sebastian Keen!